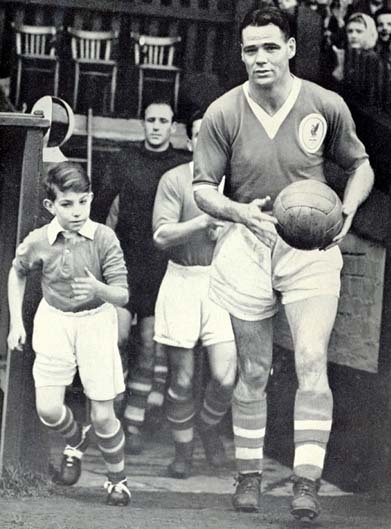 Billy Liddell in his own words - LFChistory - Stats galore for Liverpool FC! Sir Matt Busby former Liverpool captain and legendary manager of Manchester United was the man to whom we are grateful for bringing Billy Liddell to the attention of Liverpool. "Let me say how Liverpool first got on to my track. I never knew the full story until a couple of years ago, when I read it in Matt Busby's book. Although a Liverpool player at the time, Matt still retained many connections with Manchester City and his former colleagues at Maine Road. During the summer he and Alex Herd used to play golf together back home in Scotland. One day Alex did not turn up for their usual round, and upon making inquiries from him later Matt learned that he had taken Willie McAndrew, the manager of Hamilton Academicals, in his car to see my parents about getting me to sign for his old club. On being told by Alex that I had turned down the invitation Matt immediately telephoned Mr. George Kay at Anfield and suggested that this Liddell lad might be worth an inquiry. 'Liddell eventually became a Liverpool player, a very fortunate day for Liverpool', says Matt, who goes on to add some complimentary remarks about me which are best left unsaid here. But let me add it was also a very fortunate day for Billy Liddell. I could only stand and stare. I hadn't the slightest idea what the question conveyed. Football at that moment was far from my thoughts and Liverpool had never been in them at all. When I found words at last all I could say was: 'What on earth do you mean?' Then it came out bit by bit, and as it did I realized that, at the age of sixteen-and-a-half, I was at an important crossroads in my young life."